Tonya Duncan Ellis is the author of the Sophie Washington book series: Queen of the Bee, The Snitch, Things You Didn't Know About Sophie and The Gamer. She also writes feature articles for family magazines. Born and raised in Louisville, KY, she lives with her husband and three children in Houston, TX. Sophie Washington: Things You Didn’t Know About Sophie by Tonya Duncan Ellis is a children’s Grade 4-6 fictional novel; this is a book that would appeal most to a mixed audience of children, tweens, and teens who enjoy drama fiction where the main characters are girls. Sophie Washington is an eleven-year-old girl who is in the sixth grade at Xavier Academy. This year Sophie has developed a crush on new boy Toby Johnson, who just transferred to Xavier Academy after his family moved to Texas from Cleveland, Ohio. Not only does Sophie have to deal with her crush making goo goo eyes at her best friend Chloe, but she is also one of the few people her age who does not own a cell phone and she is determined to change that one way or another. Will Sophie get the boy and her cell phone, or will her plans land her in hot water? Sophie Washington: Things You Didn’t Know About Sophie by Tonya Duncan Ellis is a well written children’s story filled with realistic characters who each had their own unique personalities. I felt like the author really captured the way kids feel and respond to situations in this novel. The way that Sophie claims to have an iPhone to her friends when she does not reminded me a of a friend of mine that did the same thing in 5th grade. The black and white illustrations added a nice visual element to the novel that would appeal to child readers. Overall, I enjoyed reading the book and I found it reminded me a bit of the Junie B Jones books with how they both managed to truly capture the personality of a child in their main characters. 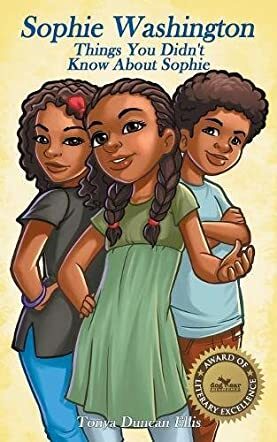 Sophie Washington: Things You Didn't Know About Sophie is the third book in Tonya Ellis’s series for children, grades 4-6. Sophie really wants a cellphone for her eleventh birthday. Her best friend, Chloe, and all her other friends have cellphones, but Sophie’s mom doesn’t feel that preteens should have them. Sophie’s dad understands her frustration though, and thinks it might not be a bad idea for her to have a cellphone since her mom has been working with him in his office in the afternoons. But can Sophie wait for her birthday to arrive? Feeling left out and different from the others makes her blurt out to her friends that she has a new iPhone; a lie she instantly regrets. Rather than admit that she lied, Sophie tries to borrow one from her father’s office and then from one of Cole’s friends. Things can only get worse after that, and Sophie begins to wonder if her nose will grow like Pinocchio’s from the growing web of untruths. Then something awful happens. Tonya Ellis’s novel for children, Sophie Washington: Things You Didn't Know About Sophie, continues her saga about the 10-year-old Texan and her family. In this book, Ellis deals with the stresses kids often feel due to peer pressure. Not all parents can afford to buy their kids the newest iPhones, sneakers or designer clothing. Nor do all parents feel their kids should have their own cellphone until they’ve proven themselves to be mature enough. Sophie’s frustration leads her to make all the wrong choices due to that pressure and seeing how she finally 'fesses up and understands why she behaved as she did is very well handled. Ellis also deals with preteen crushes, jealousy between friends and the difficulty new kids may have in making friends in a new school in this engaging and well-written tale. Sophie Washington: Things You Didn't Know About Sophie is most highly recommended. Things You Didn’t Know About Sophie by Tonya Duncan Ellis revolves around Sophie, a sixth grade student. The story begins with readers getting introduced to the new boy, Toby Johnson, who has joined Sophie’s school this past fall. Sophie has a crush on him, but she thinks he has eyes only for Chloe, the prettiest girl in their class. She decides to play basketball so that she can attract Toby’s attention. Sophie is also excited that the entire class is going to Austin for their Texas history trip. As the book progresses, readers get to know many other interesting facts about Sophie, and how she handles her growing up phase, peer pressure, and her lying . The story is entertaining and the author sketches characters that are real and relatable to readers. Whether it is Sophie or Toby or Chloe, or any other character in the story, they definitely strike a chord with readers. The narration is detailed and descriptive, making the scenes vivid and lively. The author's style of expression is simple, neat, and elegant, and the fluidity in writing gives a good pace and movement to the story. The black and white illustrations connect readers well with the characters, and the moments they share with each other while at home and at school. The school ambiance, the classroom scenes, and the friendship between the characters are tangible. It is an enjoyable read and what makes it an interesting read are the subtle messages about friendship and the importance of being truthful.